Miss Berry tells Mr. Carlson about the Commencement in the new Chapel, the Fords' visit, her plans to ask Mr. Ford about the building of the new dormitory and Mrs. Hammond's visit with her group's pledges for the new dormitory. 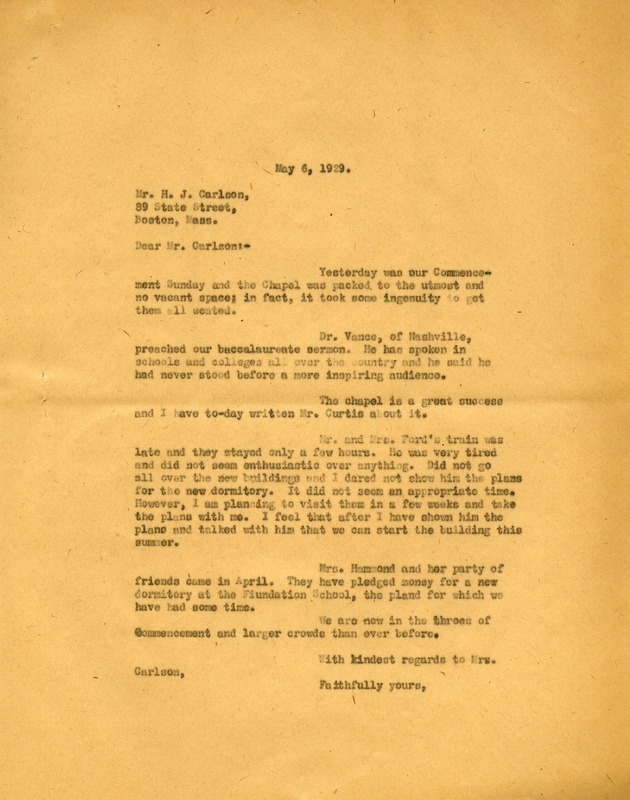 Miss Martha Berry, “Letter to H. J. Carlson from Martha Berry.” Martha Berry Digital Archive. Eds. Schlitz, Stephanie A., Rachel Renaud, Sherre Harrington, Chelsea Risley, et al. Mount Berry: Berry College, 2012. accessed April 22, 2019, https://mbda.berry.edu/items/show/9710.